The Egyptian pulley incorporates several novel, useful features. The design involves only significant compressive loading of its two components. The materials of construction are high compressive strength materials - limestone, granite or copper. The groove around the cylinder prevents rope slippage, thereby protecting the rope from abrasion but critically also maintaining the cross-sectional integrity of the rope and its twist structure. The Egyptian pulley would have allowed the pullers to be positioned on the Pyramid’s top stable, horizontal surface during construction. No remains of an Egyptian pulley have been identified; however to date no search has been conducted at the Giza plateau for remains of any pulley components. The ‘Mystery of the Great Pyramid’ would be more accurately termed the ‘Mysteries of the Great Pyramid’ because the Great Pyramid poses several mysteries including broadly why and how it was constructed. Regarding the mystery of how the various pyramid stones were lifted, it is likely that the Egyptians used several different techniques depending on the particular stone lifting challenge they faced, from the 2.3 million, 2,268 kg core stones to the few 40,000 kg, stress-relieving, granite slabs above the roof of the King’s Chamber. Any proposed stone lifting technique theory to be considered seriously must be technologically and culturally plausible and demonstrated in a full scale experiment. The subject of this paper, a rudimentary pulley, meets these requirements. A pulley changes the direction of a rope. It is typically used to lift objects. A conventional pulley is composed of three components: an axle, a grooved wheel (sheave) and a support fixture for the axle and as an attachment point to its foundation. Egyptologists generally agreed that the Old Kingdom (Dynasties 4-8, circa 2575-2134 BC) Egyptians did not utilise a conventional pulley (deHaan 2010, 1). In any case, they could not fabricate a conventional, robust pulley because, being in the late Copper Age with only wood and copper available, they lacked a material for a high strength pulleyaxle (Isler 2001, 262). This view (the lack of a robust conventional pulley) is often proffered in discussions regarding Great Pyramid construction because the pulley would have been highly useful not only because of the mechanical advantage it offered (in the use of more than one pulley, in a system) but also because of its rope direction-changing capability and its capability of applying a high pull force in a limited space, for example, for lifting the 2.3 million, 2,268 kg stones for the Great Pyramid, at the rate of about one stone every three minutes for approximately 30 years (Hawass 2005, 20). But the Old Kingdom Egyptians could have plausibly created and employed a simple but robust pulleycomposed of a polished cylinder which rotates in an open cradle with a polished, mating surface, what is labeled the Egyptian Pulley (See Figure 1). Such a mechanism experiences only significant compressive loading, thereby allowing the use of materials with high compressive strengths, which were available to the Old Kingdom Egyptians,namely limestone, granite and copper. 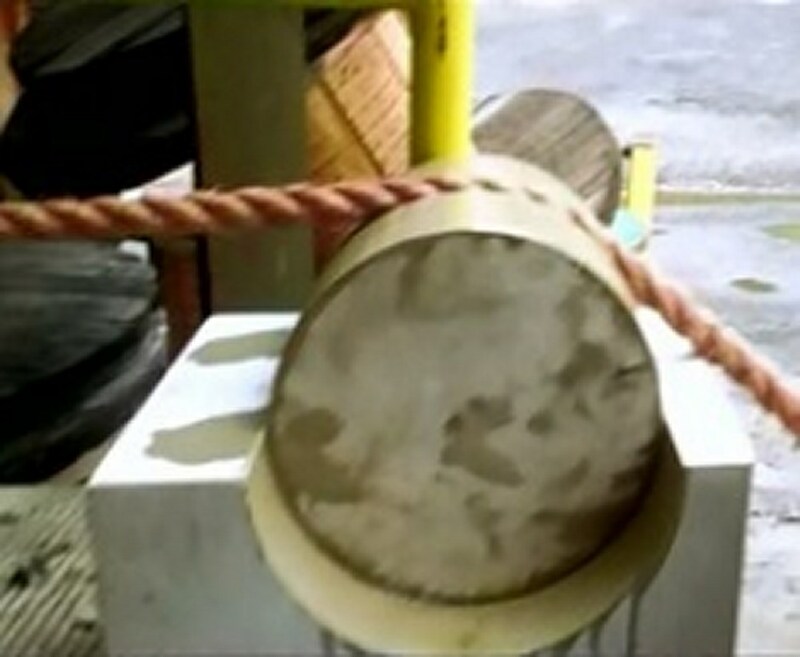 The (circumferential) portion of the cylinder in contact with the rope would be grooved to maintain the rope’s cross sectional integrity and roughened sufficiently to prevent rope slippage and related abrasion (See Figure 2). Except for this grooved area on the cylinder, readily available lubricants, for example, olive oil or rendered animal fat, would be utilised on the cylinder and cradle mating surfaces. All the necessary materials, limestone, granite (Lucas and Harris 1962, 35, 52), copper, plant oils, animal fats and natural resins (Nicholson and Shaw 2009, 157, 407, 408, 430-431) to fabricate and utilise the Egyptian Pulley were available to the Old Kingdom Egyptians. The Old Kingdom Egyptians exhibited superb limestone and granite sculpting and polishing skills (Nicholson and Shaw 2009, 33-36) and the ability to precisely cast and work copper (Nicholson and Shaw 2009, 157; Stocks 2007, 44). Further, the Old Kingdom Egyptians are known as the first great rope makers, for example, bundles of well made, plant fiber rope were discovered with Khufu’s solar barge at the site of the Great Pyramid in 1954 (Brier and Houdin 2008, 52; Ryan 1993,72). 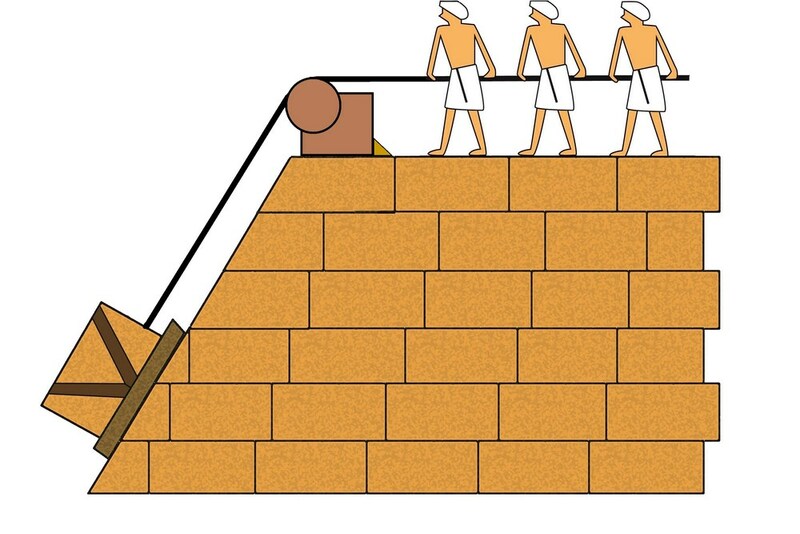 The Egyptian pulley would have enabled the Egyptians to pull Pyramid stones up the 52 (51.8 more precisely) degree incline (Lehner 1997, 209) of the Pyramid sides during construction by allowingthe pullers to be on a stable, horizontal surface. Figure 3 is a simplified illustration (in the style of ancient Egyptian wall painting) showing the basic operation of the Egyptian pulley. Figure 3 does not illustrate stone unloading, but, for example, after the stone on a wooden sledge reaches the top edge, a movable stop behind the cradle could have been removed, with the stone on its sledge then pulled onto the top surface. 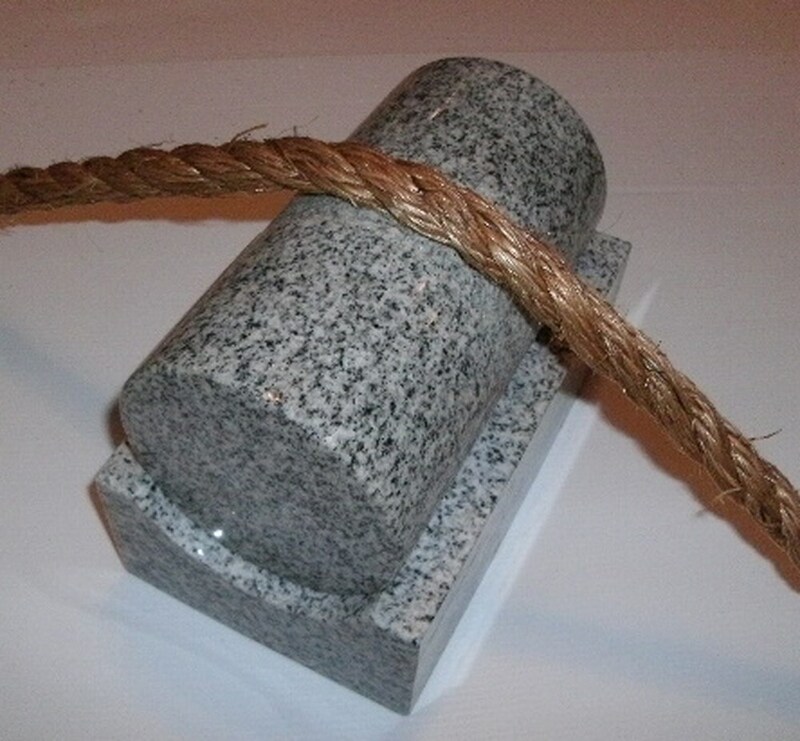 Based on elementary stress analysis, a prototype Egyptian pulley was designed and fabricated from granite, with the goal of demonstrating its function as a pulley (See Figure 4). The prototype Pulley had a cylinder diameter of 10.2 cm and an axial length of 18.0 cm; the cradle had a (inside) diameter of 10.3 cm, a length of 20.5 cm, with an angular span of 120 degrees; the combined weight was 7.0 kg. 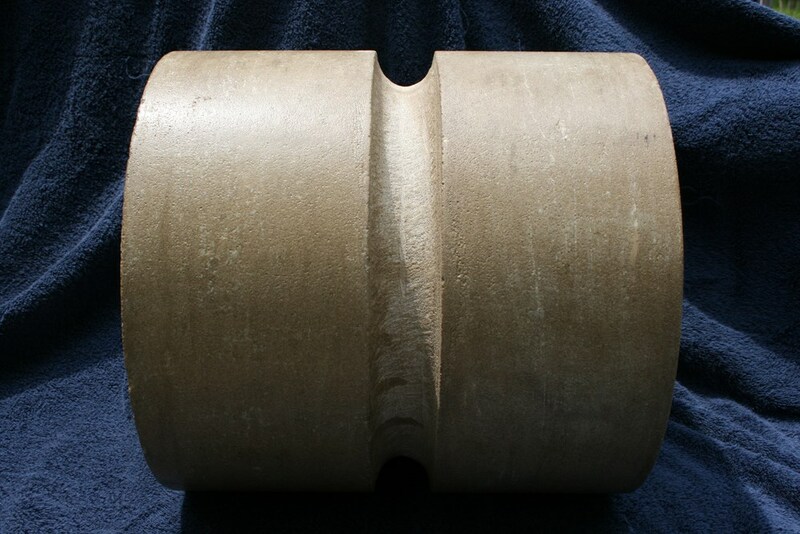 The mating cylinder-cradle surfaces were polished and lubricated with a thin film of rendered animal fat during the tests.Manila (plant fiber) rope, 3.8 cm in diameter, was selected as the pull rope. Weights were pulled up an incline using both a hand winch and a tractor using the prototype pulley, with rope tension measured using a simple rope-deflection tension meter. The tests encompassed a range of weight pulls, from 25 to 545 kg, through a range of rope span angles (that is, the transition at the pulley), from 15 degrees to 45 degrees. All tests successfully demonstrated the concept of the Egyptian pulley, that is, the pulley sustained no damage, rotated freely, with no rope slippage and without any related rope damage. Based on the successful prototype demonstration a full scale Egyptian pulley was designed, fabricated and demonstrated; ‘full scale’ in that the pulley would be intended to lift a 2,268 kg weight. To facilitate the full scale demonstration efforts the University of Illinois Department of Mechanical Science and Engineering (Urbana-Champaign, Illinois, US) was enrolled as a participant. S. Blakely and G. Blakely sponsored and directed a team of four University of Illinois senior mechanical engineering students, Gabe Gaeta, William Caleb Gray, Yi-An Liou and Neal Jacobsma, as part of a Senior Engineering Project course (ME470) in the Spring Semester, 2013. The student team was responsible for detailed design, supplier selection, component procurement and testing coordination. 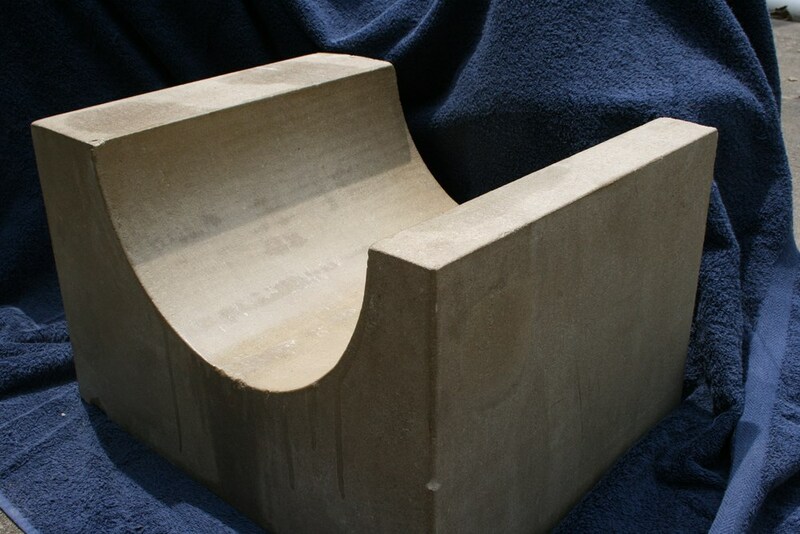 Indiana limestone, with quality similar to the Tura limestone Great Pyramid outer, finish stones (Romer 2007, 181), was selected as the material of construction for the pulley cylinder and cradle for both cost and availability reasons. Of the three plausible materials of construction, limestone, granite and copper, limestone exhibits the lowest compressive strength (Marks 1957, 5-6), significantly so. The full scale pulley cylinder diameter was 29.9 cm diameter and 30.5 cm long, weighed 48 kg with a mid-point circumferential, roughened groove to accept 3.8 cm diameter rope; the cradle had a (inside) diameter of 30.3 cm, was 35.6 cm long and weighed 95 kg with an angular span of almost 180 degrees (See Figure 5). Manila rope, 3.8 cm diameter, with a minimum breaking strength of 8,391 kg (Marks 1957, 6-175) was utilised as the pull rope. Natural resin (shellac) was used to seal the mating surfaces of the cylinder and cradle. Olive oil was used as the lubricant. Table 1. 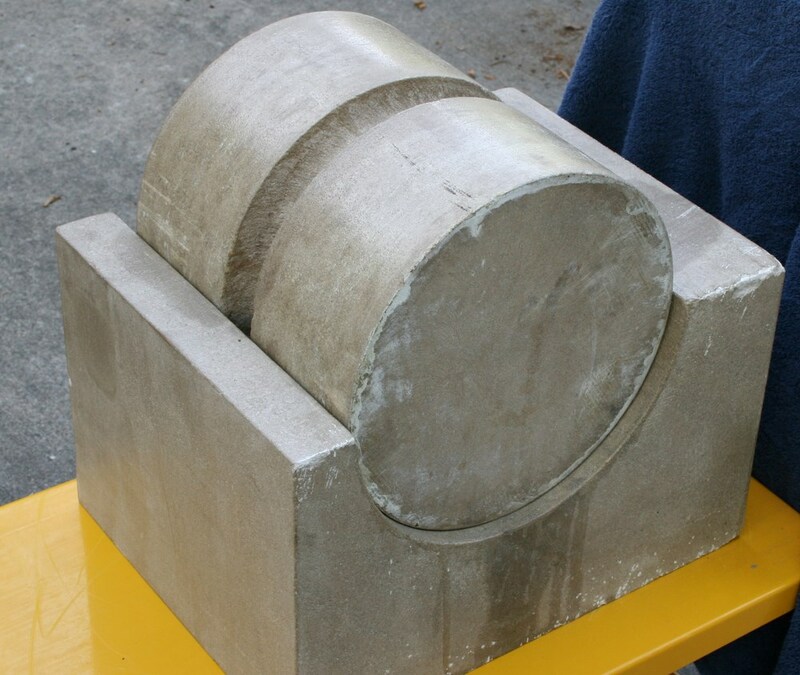 Finite Element Analysis Results: Cylinder and Cradle compressive stress levels; and as percentages of high quality limestone compressive strength. A full scale (nominal 30 cm diameter) Egyptian Pulley under a 2,268 kg weight pull. The project culminated in a full scale demonstration on 15 April 2013 at Marcal Rope & Rigging (Alton, Illinois US), which has comprehensive rope and rigging testing facilities. An industrial tractor was used as the pull force, for safety reasons, on a horizontal surface to pull the rope attached to the weight over the pulley (See Figure 6). The test set-up was instrumented with a precision, digital load cell, transmitting wirelessly to a local PC, positioned in series with the pull rope, between the weight and pulley. The weight was pulled successfully to a maximum rope tension of 2,079 kg, at a 50 degree incline - versus the above-noted 2,120 kg theoretical, at 52 degree incline, for a rope tension variation, measured versus theoretical, of -1.9 %. The pulley rotated freely throughout, sustaining no damage; the rope did not slip, also sustaining no damage. The full scale demonstration evidenced that the Egyptian pulley is a robust mechanism that the Old Kingdom Egyptians could plausibly have developed and utilised. It performed as a true pulley, efficiently, safely changing pull rope direction while protecting the surface and cross sectional integrity of the rope. Further, larger limestone pulleys and ones made of granite or copper would allow lifting of much heavier stones (with a larger diameter, higher strength rope). Planning is underway for a project to lift a 2,268 kg limestone block, similar in dimensions to a typical Great Pyramid stone, up a 52 degree incline using human pullers. It is estimated that 70 pullers will be required. The rate of stone lifting will be investigated as will be stone loading and unloading techniques. The ultimate project goal is the production of a documentary to chronicle the project efforts, including a search at the Giza Plateau for discarded pulley components. To keep abreast of progress, visit www.egyptianpulley.com. The Egyptian pulley incorporates several novel, useful features. The design involves only significant compressive loading of its two components. The materials of construction are high compressive strength materials - limestone, granite or copper. The groove around the cylinder prevents rope slippage, thereby protecting the rope from abrasion but critically also maintaining the cross-sectional integrity of the rope and its twist structure. The Egyptian pulley would have allowed the pullers to be positioned on the Pyramid’s top stable, horizontal surface during construction. Relatively small, light-weight, and easily repositioned, pulleys could have been used in relatively confined areas, readily disassembled, and easily repositioned. It is estimated that with the use of ten pulleys, each manned by 70 pullers alternately manning two pulleys, with each puller exerting a 29.5 kg pull force (Isler 2001, 16), the requisite three stones per minute lifting rate could have been realized. No remains of an Egyptian pulley have been identified; however to date no search has been conducted at the Giza plateau forremains of any pulley components. Pulley components may exist in, for example, archaeological rubble or fill for subsequent structures but have been overlooked, for example, as a discarded column segment, or a stone remnant with an architectural grooved feature. BAUMEISTER T. (ed.) 1957 Marks’ Mechanical Engineers’ Handbook, New York: McGraw-Hill Book Company. BRIER B. and HOUDIN J. P. 2008 The Secret of the Great Pyramid, New York: Smithsonian Books/HarperCollins Publishers. DE HAAN H. J. 2010 The Large Egyptian Pyramids, Oxford: Archeopress. HAWASS Z. 2005. The Riddle of the Pyramids. Ancient Egypt, Vol. 5, No. 5, pp. 19-25. ISLER M. 2001 Sticks, Stones, & Shadows, Norman, OK: University of Oklahoma Press. LEHNER M. 1997 The Complete Pyramids, New York: Thames &Hudson. LUCAS A. and HARRIS J.R. 1962 Ancient Egyptian Materials and Industries, London: Edward Arnold Ltd.
NICHOLSON P.T. and SHAW I. (eds) 2009 Ancient Egyptian Materials and Technologies, Cambridge: Cambridge University Press. ROMER J. 2007 The Great Pyramids, Cambridge:Cambridge University Press. RYAN D. P. 1993. Old Rope. KMT, Vol. 4, No. 2, pp. 72-79. SESSIONS R (director) 2012.Unearthing Ancient Secrets: Engineering Ancient Egypt. (DVD). United Kingdom: Atlantic Productions Ltd.
STOCKS D. 2007. Technology Innovators of Egypt: Part Two. Ancient Egypt, Vol. 7, No. 5, pp. 44-51. Twenty Years with Flint. The Society for Experimental Prehistoric Archaeology – Where are We Now?